NI’s poverty woes have been in the headlines this week – the last decade has been wasted. However, the story goes further: the nature of poverty has changed, which must be recognised if the problem is to be fixed. You might have seen the headlines. “Almost one in three adults jobless as war on poverty sits stalled for a decade”, per the News Letter. “Almost one in three working-age adults in Northern Ireland is jobless, report says” says Belfast Live. Northern Ireland has wasted a decade getting nowhere with local poverty. It has been a difficult time – the period since the credit crunch, pretty much – but the rest of the UK has done significantly better. This is all according to a report released this week by the Joseph Rowntree Foundation (JRF), Poverty in Northern Ireland in 2018. Almost a fifth of the population lives in poverty – around 110,000 children, 220,000 working-age adults and 40,000 pensioners. These figures are galling but they do not tell the whole story. Some of the news is, ultimately, good: poverty among pensioners has fallen considerably over the last ten years, for instance. And, while poverty rates have been fairly constant, overall stability means that, for every bit of good news, there is some bad news as well. What we have seen is a shift in the demographics of poverty. Moreover, an unchanging poverty rate, with or without demographic flux, is itself a failure. This is a problem we are supposed to be doing something about, after all. The good news – a fall in the proportion of pensioners living in poverty from 19% between 2003-06 to 14% in the equivalent period a decade later – is good for two reasons: firstly, any reduction is good; secondly, we have an ageing population and there are a lot more people aged 65 and over. Child poverty has dropped slightly over the last decade, down two percentage points to 25%. All this is offset elsewhere. Poverty amongst working age adults has increased slightly – from 18% to 20% across the ten-year period. The group with the highest poverty throughout the last decade is lone parents (44% in 2003/06 and 40% in 2013/16). 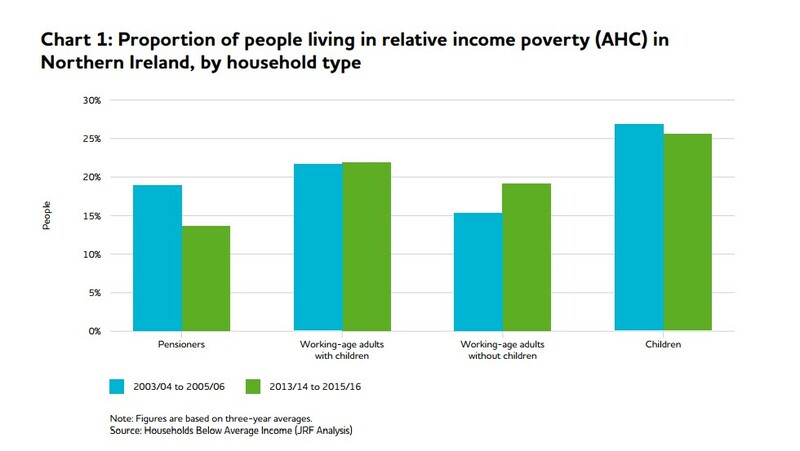 However, analysis for the UK as a whole suggests that, although lone-parent poverty has fallen over time, there are signs it is set to rise again. Poverty for couples with children has risen slightly, from 18% to 19%; couples without children (the cohort which has always had the lower poverty rates) has seen an increase from 10% to 13% in poverty; there has also been a rise among single people without children, from 20% to 24%. “Overall, 57% of people in workless households are in poverty in Northern Ireland, compared to 13% of people in households with at least one person in paid work. “In Northern Ireland, 14% of working-age households were workless in 2016. Worklessness has consistently been higher in Northern Ireland than in England or Scotland and has been steady or risen slightly in recent years, in contrast to falls in the rest of the UK. The employment rate in Northern Ireland has fallen significantly behind England, Scotland and Wales. However, it is important to know that the issue here is not unemployment, which is only slightly higher in NI than in the other parts of the UK. The problem is, therefore, economic inactivity (a person is economically inactive if they are of working age, are not employed, and are not seeking work – a group which can include students, full-time carers or people who are long-term sick). In its conclusions, JRF says: “The poverty rate in Northern Ireland is slightly lower than in England or Wales, although slightly higher than in Scotland. “Educational attainment at age 16 has improved over time, and the gap has narrowed slightly between those eligible for free school meals and all pupils. Nevertheless, a very large gap remains: only 47% of children eligible for free school meals achieve at least five A*-C GCSEs or equivalent, including English and maths, compared to 68% of all children. There is a lack of information in Northern Ireland about attainment earlier in children’s lives, in contrast to the rest of the UK. Wider evidence suggests that attainment gaps are present by the time children start school, but then widen as they grow older. “Among the adult population, Northern Ireland stands out as having more people with no qualifications and fewer people with high qualifications in Northern Ireland than in the rest of the UK. The contrast with Scotland is particularly stark – 45% of adults in Scotland have a higher education or degree-level qualification, compared to only 31% in Northern Ireland. Only 9% of people in Scotland do not have any qualifications, compared with 16% in Northern Ireland. Northern Ireland needs to change a number of things to make serious efforts to tackle poverty. There is a network of interconnected issues and progress needs to be made on each of these in order for real benefits to be felt. The report points out that, in NI, people from lower-income backgrounds tend to have significantly lower academic attainment. A lack of qualifications makes it more difficult to get a job and, for those in employment, tends to mean lower wages. This dynamic is one of the central pillars of intergenerational poverty. NI has, per capita, nearly twice as many (16%) adults with no qualifications when compared with other parts of the UK. Then there are our outcomes for disabled people, which feeds into our very high rates of economic inactivity, which itself fuels our high number of workless households. When you factor in concerns over pension planning – only 55% of working-age adults in employment are participating in a pension scheme – it is easy to see how local poverty could grow and grow. The requirement is for long-term planning, which improves educational attainment at all ages, improves employment prospects (and, in particular, seeks to reduce economic inactivity), and improves pension provision.